Marking the first ever debut in 2012 the LF-LC from the house of Lexus has been doing pretty well. Recently in the year 2015 company showcased the LF-LC Concept and here they are with the production version, titled Lexus LC 500 2017. 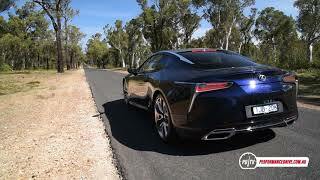 The 2+2 coupe is aggressively designed at exterior and features a naturally aspirated interior. 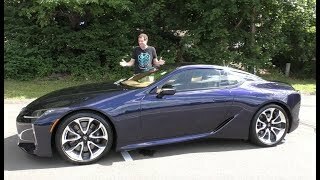 Let us have a look at the review of Lexus LC 500 2017 to know in detail. The interior of Lexus LC 500 2017 is simply mesmerizing. You can notice sewn leather and Alcantara all around you. This includes the dashboard, steering wheel and the center console. The instrument cluster behind the three-spoke steering wheel is designed simple and features a single tachometer gauge. There is also a digital display above the digital fuel gauge. Talking about the center console, the unit includes a sports shifter and an extra grab space for better grip during high-speed turns. The integration to a lot extent can bother the front passenger while operating the infotainment system. 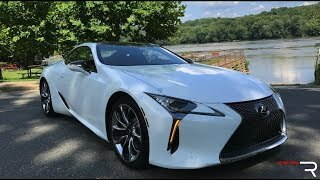 Thus rounding up the interior details of Lexus LC 500 2017 I would say it’s just amazingly luxurious. The exterior of Lexus LC 500 2017 is an impeccable amalgamation of an engineer’s brain and a designer’s heart. Starting with the front fascia, it has the traditional Lexus Spindle grille featuring 3-D mesh design. On the either corners of grille are the headlights that are borrowed from the concept version. Into the headlights you’ll notice the vertically housed LED daytime running lights while below them are the small air vents to contribute aerodynamically. Moving towards the rear end the sloping roof touching the elevated trunk lid and the multi-layered taillamps add remarkable to the looks. There is a bland diffuser beneath with twin dual-exhaust pipes getting surrounded by rectangular trim. Along the sides the muscular wheel arches and the beefy side skirts complement the overall exterior appearance of Lexus LC 500 2017. 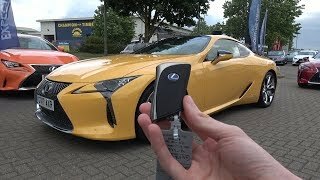 Beneath the hood of Lexus LC 500 2017 is a 5.0 liter V8 cranking total output of 467 hp and peak torque of 527 nm paired to newly developed ten-speed automatic transmission. The performance figures of Lexus LC 500 2017 are still not revealed but we do know that the model can knock the 0-60 mph sprint in less than 4.5 seconds.